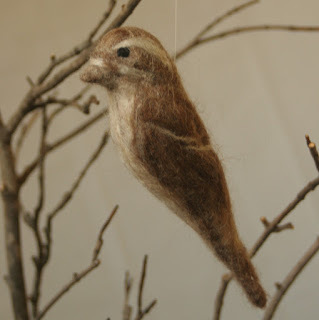 This is a female purple finch, at least as close as I can make her. Her mate is vibrant with fuschia on his head and chest and rump. (You can see a photo of him on my Feb. 9 post.) I'd like to complain about that difference, but I have to admit that God's design is more intelligent than I am - it's for her protection, and the survival of the species. I still like to make the females, because they are beautiful, just in a more subtle way. I also see it as education when folks come by my booth and can see both the male and female of the species.